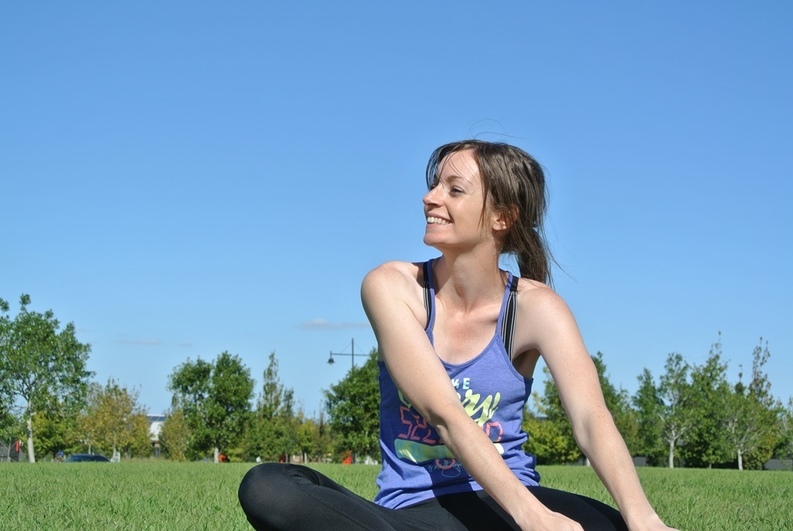 I am a certified personal trainer and pregnancy & postpartum fitness trainer who has been in the industry for nearly seven years and is based in Riddells Creek, Victoria. I am passionate and dedicated to women's health and fitness and would love to help you on your journey to optimal health and happiness. Health isn't just about exercise and eating nutritious food, it is making sure you get enough sleep, have stress management practices in place, have supportive and loving relationships and thrive in your career. Whether you are a young woman, pregnant lady or going through menopause, I can support you with appropriate movement and holistic health support to get you reaching your aspirations and feeling empowered in no time. "Kylie is a fantastic PT. She's kind and encouraging and always tries to change up her programs so you don't get bored. She's very hardworking and the fact that she loves what she does really reflects in each session." Come and move your body with me every Saturday morning for 50 minutes. All fitness levels welcome including postpartum. I am known for every class being different, so you never know what you are going to get - boxing, circuit, games etc. A combination of cardio and strength training for you to move your whole body and finishing with 10 minutes of stretching and breathing exercises to begin your weekend in a supportive way. Whether you are new to exercise or have been training for years, I can make the exercises easier or harder depending on your fitness level. You must RSVP to each class as Kylie plans the class according to numbers attending. Book your spot by TEXTING Kylie (0435 821 861). Cancellations up to 4 hours prior to the class start time are allowed, less than 4 hours notice incurs a $5.00 cancellation fee. Any questions please email Kylie at kylie@beyourradiantself.com. "From Day 1 of this program I have found it to be a huge positive in my life and have enjoyed my journey so much that I have signed up for the next round. I've followed other programs before but what makes this one stand out far above the rest is having a dedicated and enthusiastic trainer who is genuinely excited to see my results as much as I am. Thanks Kylie for making all the difference." When it comes to your health and fitness I take a very holistic approach and believe that true health and happiness comes from having harmony in all areas of your life. In our training sessions together we will chat about what your goals are and how we can get there, incorporating not only exercise but also nutrition, sleep and stress management because they all contribute to the state of your health. My personal training sessions are conducted in Riddells Creek where I have all the equipment we need, you just need to bring water and a towel. All fitness levels are welcome including pregnancy and postnatal (you must be at least 6 weeks PP and have the okay from your doctor). I am available for 1:1 or 2:1 sessions. Wednesdays at 6:00am, 6:30am, 5:00pm, 5:30pm, 6:00pm and 7:00pm. Saturday's at 7:30am, 10:00am and 10:30am. To book your spot please text Kylie on 0432 821 861 or email Kylie (kylie@beyourradiantself.com). If you would like to have a chat about whether I am the trainer for you and what you are wanting, please text me and I can then give you a call or we can meet for a cuppa at Vics at Seasons. "I was introduced to Kylie through my sister and giving her a go was the best decision I made. Her workouts are fun and I love the fact every session is different. She's happy to answer all my questions and gives me encouragement and motivation. Thanks Kylie, I'm back on track." Do you go to the gym and have no idea what to do? You walk around aimlessly doing a bit of this and a bit of that. You walk away thinking "I really wish I had a plan that I could follow". Or maybe you like to exercise at home but are sick of the same DVD's, videos and apps that you watch; you want something tailored to your body and your goals! Well, what do you know, I can help you with these problems. After you fill out the form I email you, I will put together a personalised exercise plan just for you! I go through your form to see what you want to achieve, what your fitness level is, if you have any injuries or medical conditions, how many days you want to move your body each week, what equipment you have available to you and what you love to do. From there I will work on your four week exercise plan and send it through to you within 7 days. Let me be your personal trainer from a far. Once you have your plan, you have it forever and can tweak and adjust it as you get fitter and stronger. ​No more getting bored or wandering around aimlessly. Watch your goals come to life! Once payment has been made I will send you a form to fill out and once this is returned you will receive your personalised exercise program within 7 days.